I fell in foodie love with these pretty pale green Patty Pan Squash when I visited the Union Square Greenmarket in New York City last week. 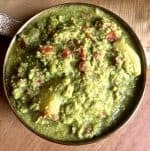 I paired them with green capsicum in a Patty Pan Squash Mint Soup, and added mint and fresh orange juice for flavour and cumin and pepper powder for a touch of spice. Lovely purple edible hyacinth flowers again from the Greenmarket made a colourful garnish. The Greenmarket was an interesting place to visit. Farmers from around NYC had brought their fresh and mostly organic produce for sale and the stalls were full of colourful heirloom tomatoes, many varieties of greens, squash, eggplant and carrots of different hues. 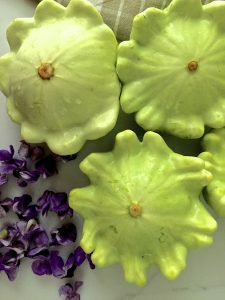 I picked up the green patty pan squash from the D’Attolico Organic Farms Stall, as well as some zucchini flowers which Clarici at the stall very kindly packed with ice so they could remain fresh (almost) till I reached back home to Connecticut that evening. The hyacinths were from the many different edible flowers in the Windfall Farms stall. I wish now that I had also bought the purple Passion Flowers, they would have added oomph to any dish! 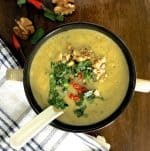 The Patty Pan Squash Mint Soup is both refreshing and healthy and doesn’t need much to be done to it once you have sliced the vegetables. 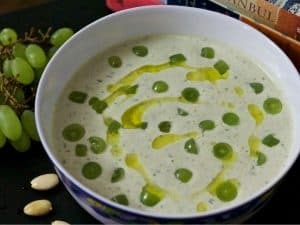 Most squash soup recipes that I checked online used yogurt, but I didn’t do that as it might have made the soup bland. Much of the nutrients in this squash, Vitamin A and C, magnesium, folic acid and potassium are said to be found in the peel (rind), and as the rind is soft and cooks easily, it is healthier not to peel it. Choose young (baby) squash as the seeds would be soft and need not be removed when slicing. There are different options you can choose for the garnish. I had fresh edible flowers and mint leaves, but would otherwise have toasted almonds and slivered them for garnish, with basil leaves. A pistou of olive oil, parsley and scallions would make for an interesting garnish. 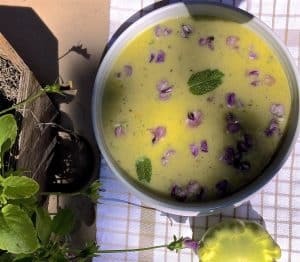 Or just make this easy Basil oil from my recipe – it would complement the soft flavours of this soup. 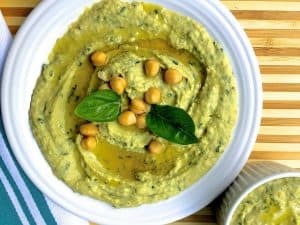 Simple Fresh Lemon Mint Basil Hummus Dip which is easy to make and has all the goodness and flavours of the herbs and garlic. 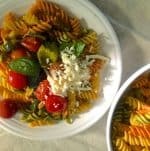 Serve with homemade pita bread. 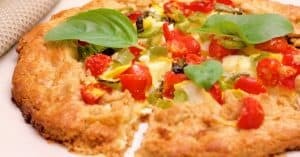 Simple savoury herbed Patty Pan Squash Tomato Tart with a healthy whole wheat and oats crust. Easy even if you are making tart crust for the first time. 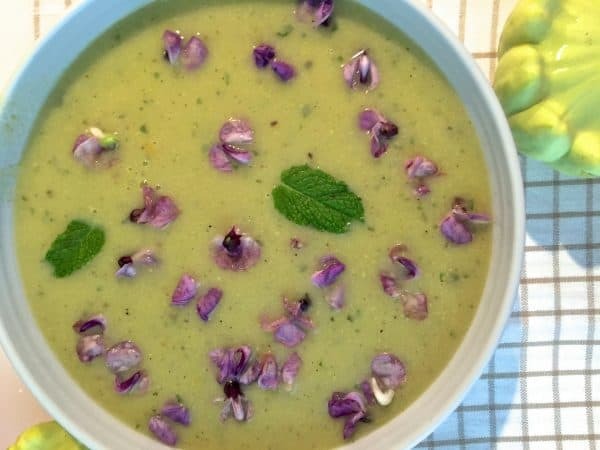 Green Patty Pan Squash Mint Soup with Orange and Hyacinth and Green Capsicum plus a dash of cumin and pepper to spice it up. Delicious, refreshing, easy. 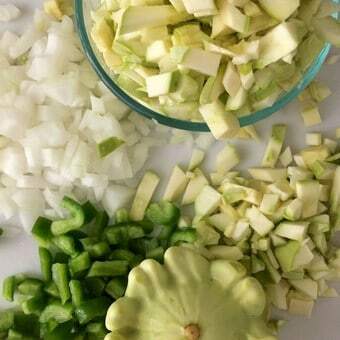 Slice the pattypan squash, capsicum and green onion. Mince mint leaves after reserving some for garnish. Toast almonds if using, and slice into slivers. Heat the oil in a pot or tall pan, add the onions and sugar and sauté for about 5 minutes till just before they begin to brown. Add the capsicum and squash slices, cumin powder and ground pepper and sauté for 3 minutes. Add the water and half a teaspoon of salt, stir. (for a thicker soup, add only 2 cups of water instead of 3). Bring to a boil on high heat and then simmer, covered, on low heat for 10 minutes. Check that the squash has cooked (it will mash if you press a slice with a spoon or with your finger). 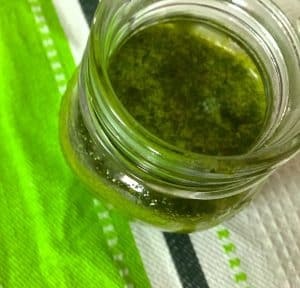 Add minced mint leaves, stir and remove from the stove. Cool the soup and puree with a hand blender or in a processor. 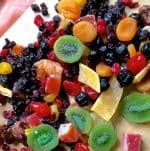 The puree need not be smooth but can have small pieces of the vegetables to add texture to the soup. If using a processor, make sure the soup has cooled before you puree it as hot soup may splash out otherwise. Pour the pureed soup back into the pot and place on the stove. Check and add salt to taste. This is a lightly flavoured soup so go easy on the salt so it does not overwhelm the other flavours. Bring the soup to a boil, reduce the heat, add orange juice and remove from the stove. 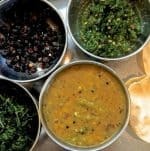 Serve hot, garnished with mint leaves and edible flowers or with mint leaves and either basil oil or sliced toasted almonds.